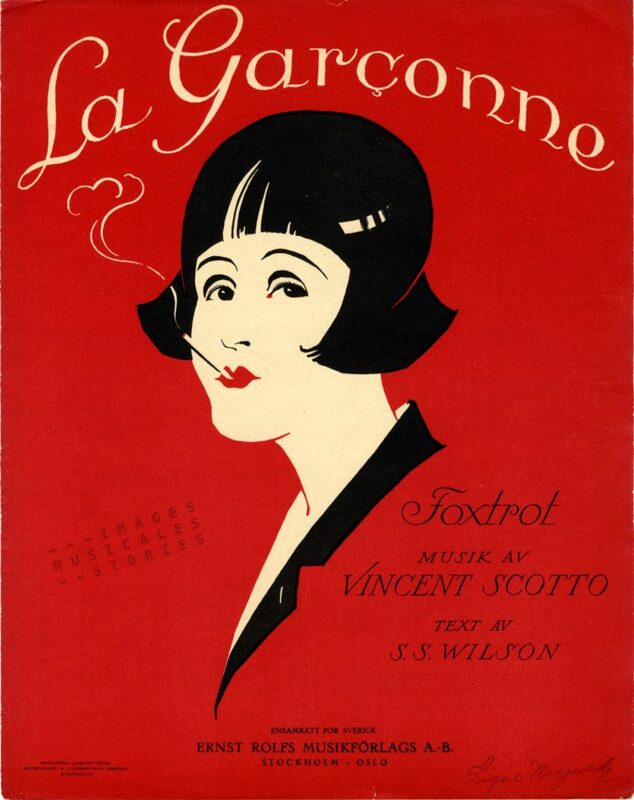 ‘La Garçonne’ by Vincent Scotto published by Ernst Rolfs Musikförlags, (Stockholm, sd). In the Twenties restrictive corsets became old-fashioned. Women opted for flat-chested dresses, they cropped their hair and started smoking cigarettes. This boyish look was called à la garçonne. 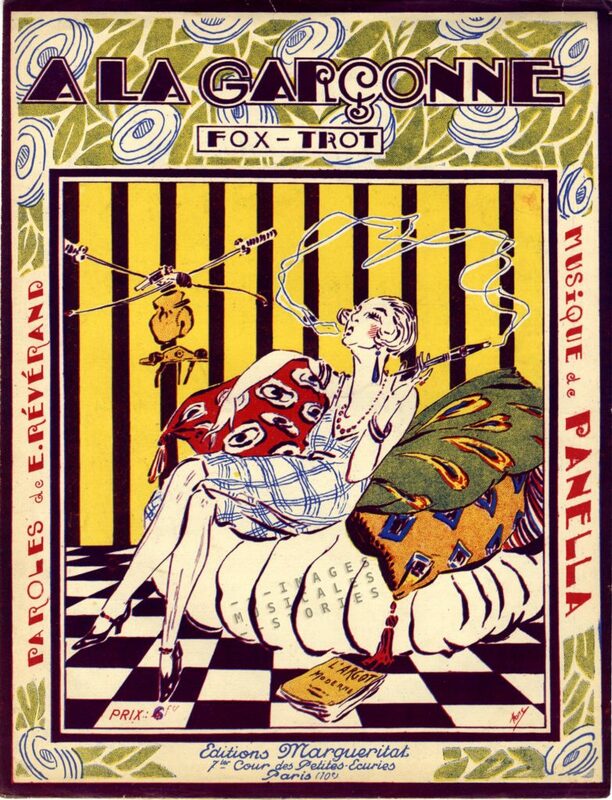 ‘A la Garçonne’ by Henri Panella & Edouard Révérand, published by Margueritat (Paris, sd) and illustrated by Pons. This year André Téchiné directed the film Nos Années Folles (The Golden Years). It is based on the true story of the French deserter Paul Grappe, nicknamed la Garçonne. The Great War broke out as Paul had nearly finished his military service. He was wounded in August 1914, and a second time in November when his index finger was ripped off. He was first accused, and shortly afterwards exonerated of voluntary mutilation to escape the battlefield. Facing his imminent return to the front in the middle of 1915, Paul decided to desert. He returned to his wife, Louise. But a young man in good health walking around in Paris during the war would raise suspicion. So together with his wife they decided he should change gender. They moved to a new neighbourhood. At first he stayed inside, let his hair grow, removed his moustache and beard by electrolysis and learned to talk with a higher voice. His wife lent him some clothes, pierced his ears and gave him a pair of earrings. Paul Grappe as Suzanne, between the caretaker or pipelette and his wife Louise, somewhere in the early Twenties (from ‘Détective’ magazine, November 1928). Paul, or Suzanne as he called himself, got the hang of making his own feminine clothes. Little by little Suzanne ventured out on the street and even managed to get a job. He posed as a female friend of his own wife. 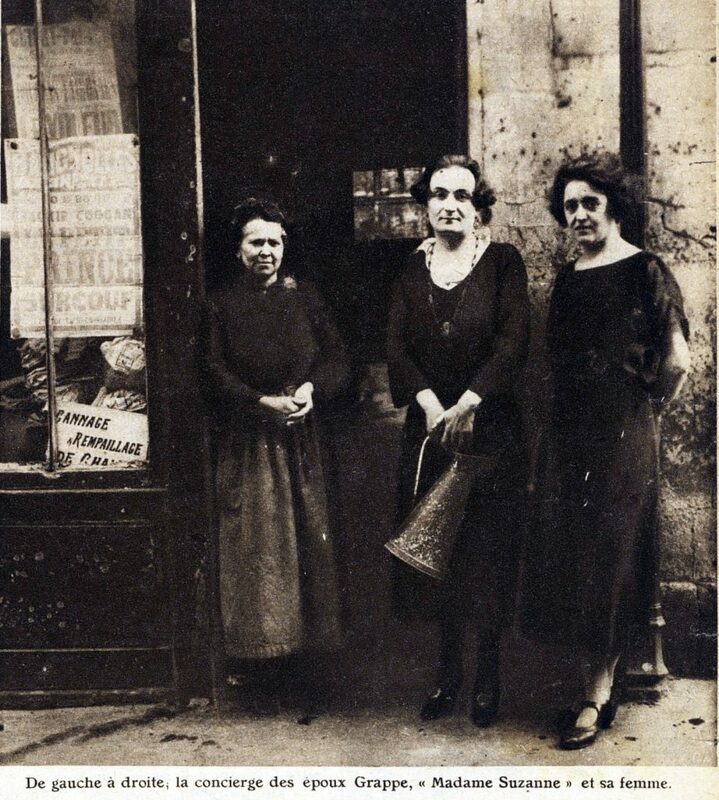 Still his masculine traits must have been visible as Suzanne was called la Garçonne in the neighbourhood. 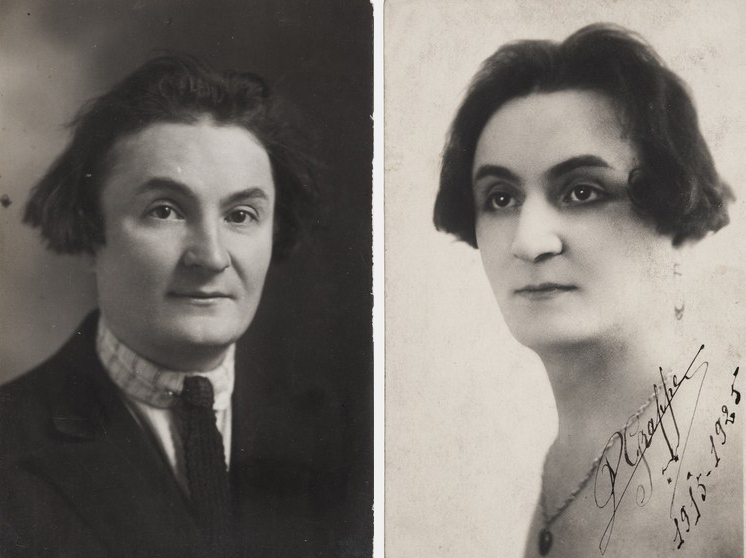 When the war was finished he continued to pretend and live as a woman because he still risked being convicted for desertion. Not until 1925 France declared amnesty for its deserted soldiers. And Suzanne became Paul again, with the necessary media attention. But he struggled to get his life under control. He was unable to find a job, and from time to time he still felt the urge to go out in drag. One night in a bar, during a heated discussion with some other patrons, and in order to prove that he was a real man, he lifted his dress, showed his masculinity and was promptly arrested for indecent behaviour. Trying to cash in on his fifteen minutes of fame he had made photographs of himself in male and female attire. With this album he wandered along the terraces of the Parisian cafés hoping to sell his autographed pictures for some change or free drinks. And he needed a lot: he drank five litres of wine a day, if we can believe the newspapers of the time. Paul Grappe as man and woman in 1925. One night in 1928 according to his wife Louise, Paul Grappe couldn’t stand the crying of their baby boy who was very ill at the moment. He awoke from his drunken stupor, “roaring like a lion”, and started to beat his wife. Fearing that he might hit their child and weary of her husbands shenanigans Louise grasped a pistol and shot him dead. Adding to the tragedy, their little son would later also die while she was in prison. 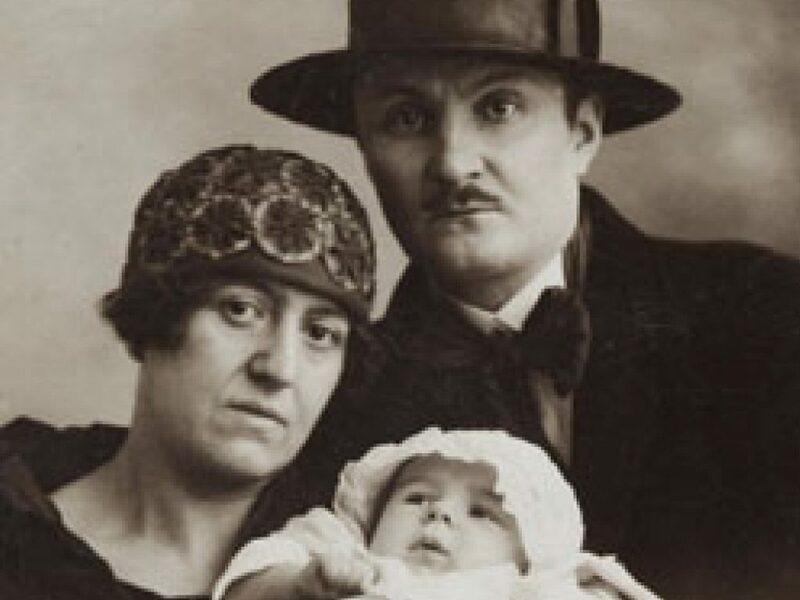 Paul Grappe, known as la Garçonne, with his wife and their baby in 1926. During her trial Louise stated that her husband had had more than 3.000 mistresses while living as a woman. She also told the court that he had been a regular at the Montmartre bars and among the prostitutes in the Bois de Boulogne. I can’t make head nor tail of that account: was his disguise not foolproof? Did he have platonic affairs or was he bisexual? Or did these women adore a man in drag..? Anyway, Paul’s neighbours testified that he was a vicious brute always carrying a revolver and menacing people with it. 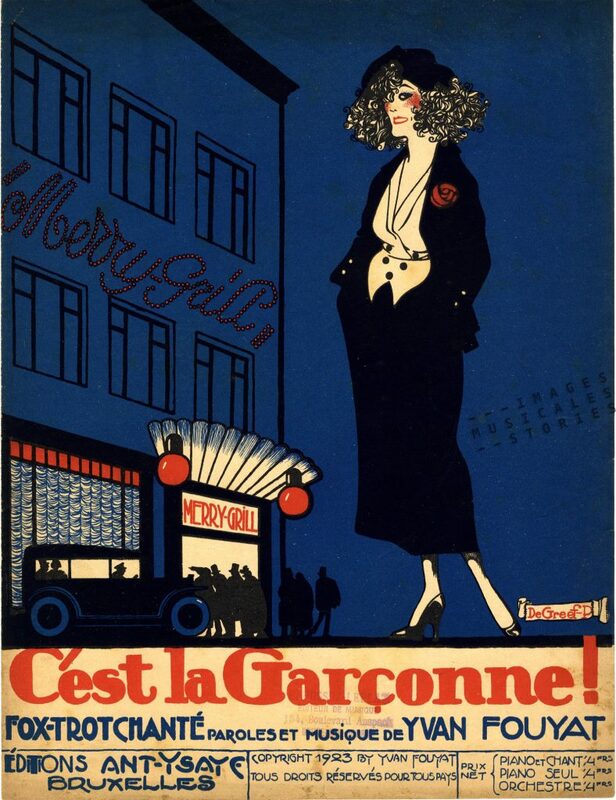 Her lawyer Maurice Garçon (what’s in a name!) argued Louise’s case eloquently and she was acquitted. 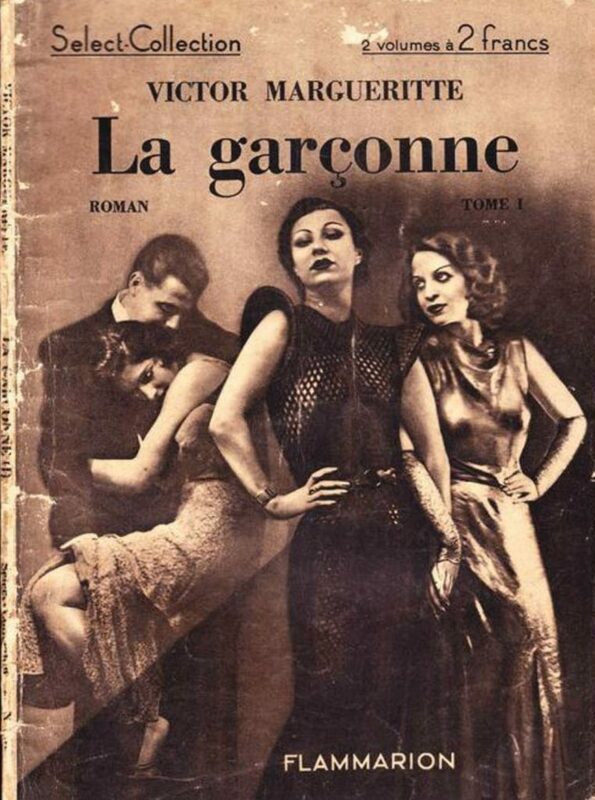 The 1939 edition of ‘La garçonne‘ by Victor Margueritte, published by Flammarion, Paris. 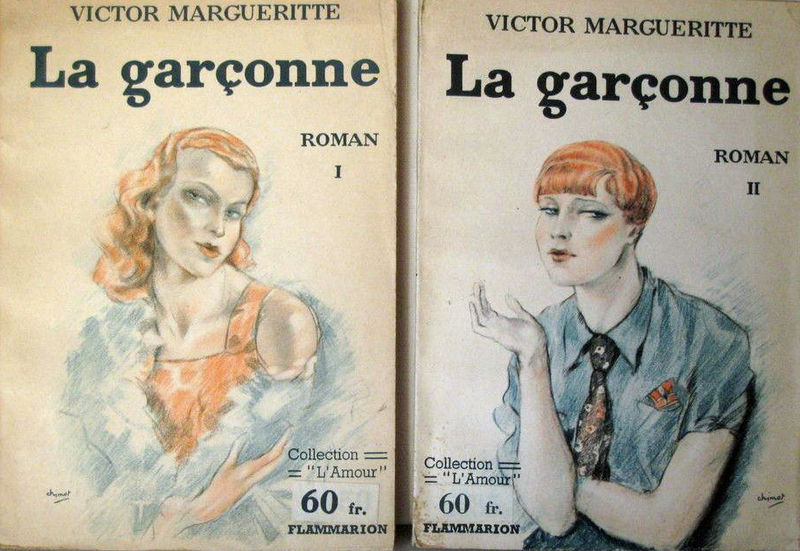 La Garçonne is also the title of a novel by the now almost forgotten Victor Margueritte (1866-1942). It was first published in 1922, the same year the French senate rejected the right to vote for women. It tells the story of a young woman promised by her parents to a wealthy fiancée who cheats on her. Disillusioned she drowns her sorrow in self-destructive libertinism. She starts to lead a life of pleasure, collecting partners of both sexes and frequenting fashionable boîtes to smoke opium or to indulge in cocaine. ‘La garçonne‘ by Victor Margueritte, published by Flammarion, Paris, the 1934 edition. She tries to redeem herself in a tormented romance with a jealous, manipulating man determined to submit her, even quite literally. But finally she falls very much in love with a respectful, modern intellectual. ‘C’est la Garçonne’ by Yvan Fouyat, published by Antoine Ysaye (Brussels, 1923) and illustrated by Peter de Greef. So, although Margueritte’s Garçonne repents by becoming a model of bourgeois virtue, the novel was still considered particularly shocking. The author was even stripped of his Légion d’honneur. That was bad. To illustrate this: last month President Emmanuel Macron said France should strip Hollywood mogul Harvey Weinstein of his prestigious Légion d’honneur. So yes, it is was that bad. 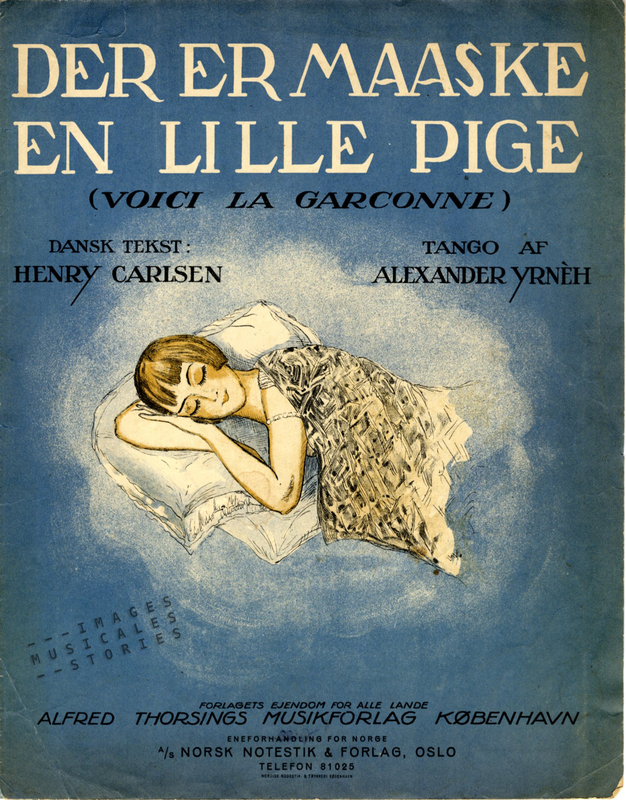 ‘Der er maaske en lille Pige’ (Voici la Garçonne) by Alexander Yrnèh & Henry Carlsen, published by Alfred Thorsings Musikforlag (Copenhagen, 1926). The scandalous novel has been adapted into a film four times, the most notable one in 1936. The heroine is played by Marie Bell who is being kept by an astonishing blonde Arletty. She discovers the nightlife and the opium dens, and arouses the lust of two female singers. One is embodied by Suzy Solidor, then a huge star of the music hall and openly lesbian. The other by a young Edith Piaf, acting and singing in her first film. 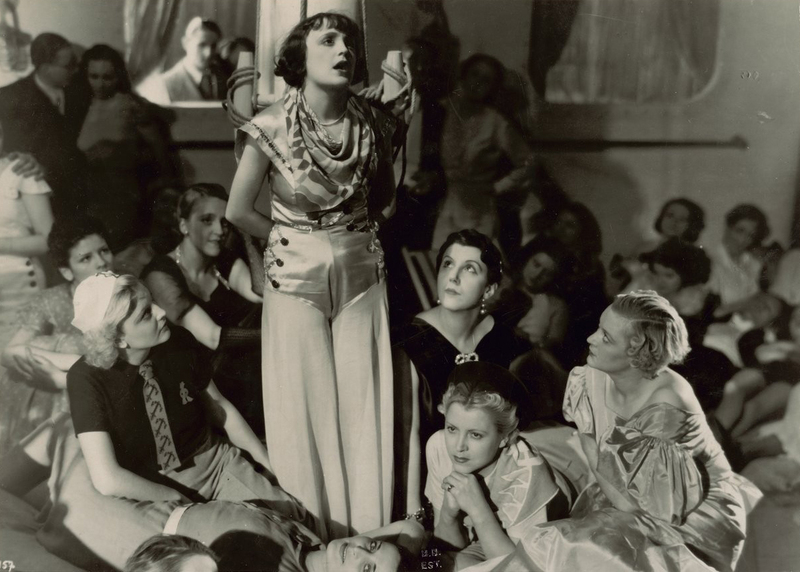 Still from La Garçonne (1936) with Edith Piaf standing in the middle. What better way to end this story than with a tragical song from this film? Edith Piaf sings Quand-même. The music is by Jean Wiener and the lyrics are from Louis Poterat. Dont on crève au lit d’hôpital. Further reading on Paul Grappe: La Garçonne et l’assassin by Fabrice Virgili and Danièle Voldman.